It’s not just the soda! Even “healthy” foods can be packed with hidden sugar. 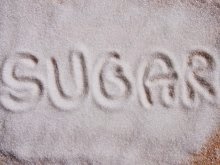 How’s this for a bitter truth: 16 percent of children’s calorie intake comes from added sugar — and the majority of that sugar is eaten at home, according to the Centers for Disease Control and Prevention. That’s not surprising, considering nearly 80 percent of packaged foods contain added sugar. And while you’d expect to find the sweet stuff in candy bars, cookies and soda, even seemingly healthy everyday foods like cereal and salad dressing can trigger a sugar high. Part of the problem: Sugar is measured on food labels in grams, which are hard for the average person to visualize. A guideline to keep in mind: 4 grams equals 1 teaspoon, which has 16 calories. What’s more, natural and added sugars are not differentiated on labels, so it’s tough to know how much is added and how much is naturally occurring, says Kate Geagan, R.D., author of Go Green, Get Lean. Some popular children’s cereals are more than 50 percent sugar, according to a report by the Environmental Working Group. Geagan suggests mixing sweetened cereals with a healthier low-sugar variety; she even mixes them right in the box, so her kids won’t be the wiser when they pour it out. While whole fruit contains some natural sugar, it’s also rich in filling fiber and other nutrients, says Geagan. But foods like applesauce, fruit leathers and canned fruit can be laden with added sugar, so look for 100% unsweetened products. If you accidentally buy fruit canned in syrup, drain and rinse it before serving. “The heart-healthy plant fats from nuts and seeds are among the healthiest fats on the planet,” attests Geagan. But some manufacturers take out that good fat and then bump up the taste with sugar. For a truly healthy spread, look for a brand that contains just peanuts and salt. These sweet sips are one of the leading sources of added sugar in kids’ diets. “Yes, they’re rich in calcium, but they also cultivate a palate for sweetness,” says Geagan. For a treat, try making your own hot cocoa with plain milk and dark chocolate or cocoa powder with at least 70 percent cacao for a hit of heart-healthy antioxidants. Some bottled dressings pack a couple teaspoons of sugar per serving. The most common culprits? French and Thousand Island. Geagan recommends carefully reading the label and making your own vinaigrettes with oil and vinegar whenever possible.